The Treasures of Dodrazeb is for anyone who enjoys history with a dash of fantasy interwoven with compelling mystery. It chronicles the adventures of Persian warrior-prince Rasteem when he discovers a secretive kingdom deep in the Himalayas. Inhabited by descendants of an ancient, scholarly society hiding powerful technology, he finds the people and their culture are by turns fascinating and frightening. At once drawn to and confounded by its strong-willed princess, the would-be conqueror has much to learn about the treasures hidden in Dodrazeb—and why the outside world isn’t ready for them. 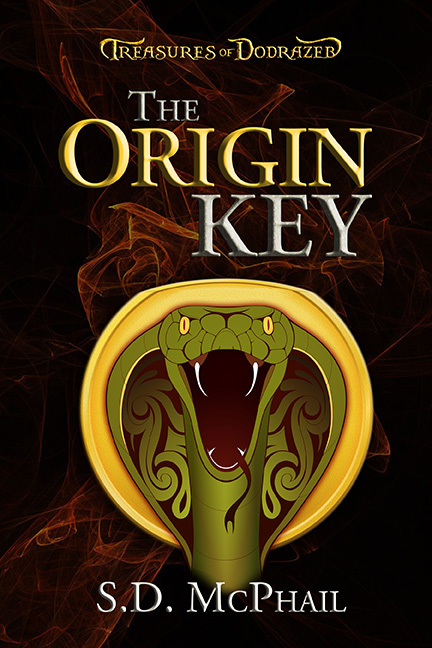 The Origin Key is the first book in the series. On a quest for vengeance against a criminal known as the Viper, Prince Rasteem becomes suspicious when his army easily conquers Dodrazeb. Princess Laneffri is desperate to expel the Persian invaders from her kingdom and will stop at nothing to protect its secrets—especially the Origin Key, a powerful, ancient device. When Rasteem learns what the Origin Key can do, he must find a way to make the princess an ally to save both their kingdoms from annihilation. 5.0 out of 5 Stars Loved it! Well thought out thriller full of adventure and pulse pounding action. I loved it and recommend it highly. This was a bit mystery, alternative history, and a bit romance. The characters were interesting and I found myself involved and rooting for them as they fought and fell in love. The mystery of who was actually the villain was well done. I enjoyed the book and it is well worth reading. I would recommend this book to anyone. 5.0 out of 5 stars Amazing read! Read it in a night since I didn’t want to put it down. You will thoroughly enjoy! The Origin Key should be added to your READ list. 4.0 out of 5 stars Good Persian Historical fiction with interesting characters and enough plot twists to keep you up late reading. A good story with interesting plot twists. This is some very well done historical fiction! The characters are well developed and interesting and the pace is good. The book pulls you in and the architectural descriptions are very nice and helpful. I’ll be reading the sequel as soon as it’s available, that’s about the best praise a book can get. 5.0 out of 5 stars If you are looking for grand adventure, look no further! This is definitely the book for you! After a brutal attack leaves their father fighting for his life, two Persian princes seek vengeance marching an army great distances to a hidden city searching for the Viper, the man responsible for the attack. Thinking to find the Viper, King of this city, in residence, they attack with vicious force only to be met with small resistance. The older brother’s rage is held in check by the influence of Rasteem, the younger prince. As he learns more of the peaceful inhabitants of the city, Rasteem is amazed and his doubts grow that it’s king can be the Viper. Filled with all the war and bloodshed of its age, this tale is also filled to the brim with adventure and magic! The hidden city brings to mind survivors of Atlantis with all the wonders that entails. Everything the city holds and all within it are far advanced for their time. They seek to peacefully spread knowledge throughout the world without endangering themselves. If you are looking for grand adventure, look no further! This is definitely the book for you! Like to sample before you purchase? Try this excerpt! This chapter takes place near the beginning of the book. It tells how Prince Rasteem and Princess Laneffri first meet, neither realizing the other’s true identity. Mounted troops rode into the valley and squads on foot went door to door inside the massive wall in a meticulous search. As comfortable in the saddle as he was leading infantry on foot, Rasteem sat astride Kurush, a glossy reddish-brown stallion with black mane and tail. Handlers from the king’s stables had said he was too high-spirited to be a suitable war horse, just like army officers had believed Rasteem was too reckless and temperamental to become a good soldier. Rasteem and Kurush proved them all wrong. When he was younger, Rasteem’s outbursts often eclipsed his brother Zardegerd’s. Time and tragedy molded Rasteem into a composed and prudent leader who channeled his uncontrollable temper into ferocity in battle. He had turned his impatience into thoughtful awareness. Rasteem rode at a slow trot across a somewhat desolate corner of the kingdom. Kamran was on horseback beside him as they approached another dwelling. The other side of the valley was a bright patchwork of trees, verdant fields, and orchards. Farms there were nourished by fresh flowing water from canals and irrigation trenches. This corner of the kingdom was home to scattered goat and sheep herders. Their livestock grazed on the scant vegetation in the rocky hills. Streams and smaller brooks brought water from the valley’s winding river, but shade was scarce. At the first dwelling they visited, an old man and woman cringed and wailed while two soldiers kept them corralled with drawn swords and menacing expressions. Rasteem and Kamran went inside, watching as soldiers rifled through the two-room, thatch-roofed hut. What they found inside surprised Rasteem. He ordered his men to be quick and thorough, respectful of the peasants’ meager possessions. He saw flagstone floors instead of hard, packed earth. There were stacks of glazed ceramic dishes and metal serving utensils, not crude wooden bowls and spoons. Cupboards and chests stored clothing and belongings. The outbuildings were also neat and tidy. Stalls and fodder for the animals, feed for chickens pecking at the hard ground, stacks of raw wool, and farm tools didn’t interest the prince. The soldiers found nothing suspicious in the hut or the outbuilding. They headed for the next dwelling and found the same type of clean, orderly home. The shrill cries of a woman and two young boys accompanied the search there. To Rasteem’s relief, the third house they visited was empty, long abandoned. He decided to split his squad and send the men in pairs so they could search faster. He and Kamran headed for the next nearest cottage. They were back in their saddles when a loud rumbling came from the boy’s direction. Rasteem looked at him. “I would have killed that panther! It would have been my second, one more than Tujee.” Kamran and Zardegerd’s second son were friendly rivals, always trying to surpass each other. Tujee had gone into battle once, but Kamran had earned bragging rights by killing an enemy in his first experience with war. If Tujee hadn’t sprained his ankle during Rasteem’s training session, he would have been in Dodrazeb with Zardegerd and Kamran would have stayed in Argakest. Brilliant sunshine beat down on them. Rasteem and Kamran slowed their horses to a walk as they neared the next deserted-looking cottage. The back of the dwelling and the dilapidated outbuilding next to it abutted a steep, rocky outcropping dotted with brambles and sparse tufts of vegetation. Its thatched roof needed repair. A crooked door dangled from a loose hinge. A broad, shallow stream flowed past a cluster of trees near the house and meandered beyond it. The trees beckoned passersby to enjoy a respite from the heat and dust. Sunlight poured through the branches onto the cool water, making the ripples sparkle. “Uncle, aren’t you thirsty?” Kamran asked. “Roasting inside your armor?” A sly grin tipped up one corner of Rasteem’s mouth. “Well…” Kamran tried to wipe sweat from his brow, hindered by his helmet. “All right, then. The horses will be grateful for a drink as well.” Rasteem dismounted and led Kurush to the stream. Alert and watchful, Kamran waited as he had been trained before taking a turn at the water’s edge. Rasteem grabbed his arm and turned him to face the small cottage. “Listen to me, say nothing,” he whispered. Kamran nodded, wondering why his uncle didn’t want to be overheard by the trees. “Do you see smoke coming from the chimney?” Rasteem asked. Kamran squinted at the distant thatched roof and shook his head. The horses took a long drink while the soldiers appeared to be engaged in casual conversation. “If they think they haven’t been discovered, their guard will be down.” Excited, Kamran almost forgot to lower his voice. “Exactly.” His uncle’s approval was worth everything to Kamran. Rasteem didn’t share his conclusion that only one or two men were hiding, a valuable lesson for Kamran with little risk of injury. He didn’t expect the occupants to put up much of a fight. Kamran jammed his helmet back on and they mounted their horses. Rasteem led them toward the little dwelling at a trot, stopping on the hard-packed earth outside it. Light did not penetrate beyond the broken dangling door into pitch-black darkness. They rode around the steep hill behind the ramshackle old cottage. They dismounted, approached the barren hillock, and peered around it. There was no sign of activity. Rasteem whispered, “Stay several paces behind me. When I go through the door, wait outside. If anyone gets past me, stop them.” Kamran’s eyes glittered with excitement. Rasteem drew his shamshir and took a deep breath. He sprinted toward the side of the hut, confident he could take the occupants by surprise. He knew Kamran could be adept at stealth, appearing from nowhere to defeat his cousins in mock battles. He signaled Kamran. With a burst of speed, he hurtled toward the doorway. The boy followed, sword drawn, hanging back as ordered. Rasteem tore the rickety door from its one loose hinge and launched himself through it with a roar. Rasteem surveyed the dark interior as his cry swelled. Trying to take in every detail at once, he missed one crucial item: a thin rope stretched across the doorway at ankle height. The trip wire sent Rasteem crashing toward the floor. A shrill scream echoing inside his skull, he twisted and tried to roll onto his back before hitting the dusty flagstones. Something heavy hit him, sending a jolt of pain through his right shoulder blade. The force knocked him forward onto his stomach and sent his sword flying out of his hand. Angry at failing to anticipate the trap, Rasteem let loose another roar and flipped onto his back. He could just make out a dark, solid shadow framed in the open doorway. Fearing for Kamran’s safety, he kicked out one foot and tripped his adversary. As the shadow started to fall, he sprang up and grabbed for its throat. When sharp teeth clamped onto his outstretched hand he roared again in pain. Something hard struck the back of his head with an explosive crack and enough force to make sparks dance before his eyes. With deep pain radiating from his thumb and a throbbing lump on his head, Rasteem saw the shadow dissolve into sunlight streaming through the doorway. He shook his head to clear his vision and heard a gasp. Instinct advising him to duck, he avoided another wallop from a heavy weapon. Rasteem pounced toward the sound and heard Kamran shout outside the hovel. Blaming himself for endangering the boy, unsteady on his feet, the warrior groped in the dark. Rasteem made contact with a warm body. He closed his fingers around a hank of hair, twisted it, and pulled his assailant toward him. They struggled, high-pitched screams overlapping his grunts. Something heavy clanked against the flagstones. Holding tight to the flailing whirlwind, Rasteem pushed it toward the door. He wanted to continue the fight in sunlight so he could see what had happened to Kamran. He crossed the threshold onto the hard-baked earth outside. He didn’t see the boy. What he did see made him loosen his grip on his prisoner. She preyed on his surprise and wrenched free. She swung around to run away, her long, thick braid of black hair whipping. Rasteem seized the braid with one hand and jerked, bringing her to a dead stop. She screamed again. He grabbed her with his other hand and pulled her to his chest, pinning her hands at her sides. He wrapped the braid several times around his hand and forced her to look up at him. As she wrestled to escape, he saw a mark on her skin behind her left ear resembling a coiled snake. Putting the discovery aside for later, he began an interrogation. “Who are you? Why are you hiding?” He intended to get answers—by force if necessary. He eyed his captive, trying to understand how a mere woman could have come so close to besting him. Her long, loose plain muslin tunic and ill-fitting trousers were dirty, the embroidered slippers on her feet tattered and muddy. Under streaks of grime and soot, her face twisted into a snarl, exposing pearl-white teeth. Rasteem had no desire to feel how sharp they were. “Barbarian devil!” she hissed. The metal scales on Rasteem’s armor tore at the thin fabric of her tunic, pressing into her flesh as she writhed. “Kamran!” He yelled, trying to look in all directions at once. He spotted the boy’s shamshir in the dirt between the hovel and its dilapidated shed. Cold dread returned. “How many of you are there?” He jerked the braid still wound around his hand. She cried out again and stared at him with raw hatred, her dark eyes glistening. He felt her heart beating against her ribs, sure it was more from struggling against him than from fear. Rasteem had the feeling she was every bit as dangerous as any lion he had ever cornered in a hunt. “What will you do with Dodrazeb now?” she demanded. “You will what?” A sneer twisted her mouth. Before Rasteem could decide her punishment, they both heard a loud groan. It came from somewhere near the small ramshackle outbuilding. “Kamran!” Rasteem pulled the woman with him toward the sound. A helmet rose from behind a pile of debris crowned by a broken stool. Vulnerable without his sword—it still rested where he had dropped it in the hovel—Rasteem braced for another attack until Kamran’s face was visible beneath the helmet. Rubbing the back of his neck, the boy came to his feet. “Behind you!” Rasteem saw movement in the shed. The second of distraction was all the prisoner needed. She yanked her braid from his hand and pushed against his chest to get away. As the woman made her move, a screaming girl in threadbare, dirty clothes burst out of the shed, hands clamped around a rusty pitchfork raised over her head. Rasteem grabbed his prisoner’s arm before she could escape and Kamran avoided the pitchfork’s sharp tines at the last moment. He sprang aside, tripped over an old bucket, and fell face-first on the ground. Rasteem’s prisoner pulled her right leg back and kicked hard, smashing her knee into his crotch. His face contorted, he let her go and grabbed his groin, reeling, unable to make a coherent sound. Eyes rolling up into his head, he dropped to his knees and fell over sideways. The woman bolted toward the girl, shouting in a language the soldiers didn’t understand. She dragged her accomplice into the shed without looking back. Kamran scrambled to his feet and recovered his shamshir, intending to give chase. Then he saw his uncle writhing in the dirt. Rasteem screwed his eyes shut and managed a ragged breath. Incapacitated by the unbearable, radiating pain from the woman’s blow, he tried not to whimper. Kamran ran to his side. “Uncle! Where are you injured? What did she do to you?” The boy’s alarm escalated when Rasteem moaned instead of answering. The Origin Key Only $0.99 + Free Excerpt! Treasures of Dodrazeb: The Origin Key, the first book in my sword-and-science fantasy adventure series, is discounted to only $0.99 through June 1st! It’s for anyone who enjoys history with a dash of fantasy interwoven with compelling mystery. This sweeping adventure chronicles a warrior’s quest for vengeance in an isolated Himalayan kingdom. Confounded by a sly princess desperate to keep her people’s ancient secrets hidden, he must recover a deadly device called the Origin Key before a murderer can use it to conquer and destroy. Get your e-book copy of Treasures of Dodrazeb: The Origin Key for only $0.99 – but hurry, this price is only good through June 1st!